Regulatory demands imposed by all levels of government add 32.1 percent on average to the price tag of a new multifamily project — costs inevitably passed on to renters once the building is complete, according to a new survey produced by a pair of homebuilder organizations. The charges include fees, land dedication and the cost of complying with various mandates, like changes to building codes or development requirements “that go beyond the ordinary,” per the study released by The National Association of Home Builders and the National Multifamily Housing Council. The full report is available here. “The purpose of this report is not to argue that all regulation is bad and should be eliminated, but to raise awareness of how much regulation currently exists, how much it costs, and to encourage governments to do a thorough job of considering the implications for housing affordability when proposing and implementing new directives,” the report concluded. The survey was conducted in the fourth quarter of 2017, and a total of 40 usable responses were received. Those responses came from developers who build in all areas of the country and virtually all types of multifamily, from high-rise city towers to garden suburban. As a share of development cost, nothing adds more to a building’s price tag, an average 7.2 percent, than changes to the building codes over the last 10 years. “Virtually no one would argue against public standards for basic soundness and safety of residential structures, but over the decades codes have expanded well beyond this and are increasingly being used as a vehicle to advance various policy objectives,” the report declared. 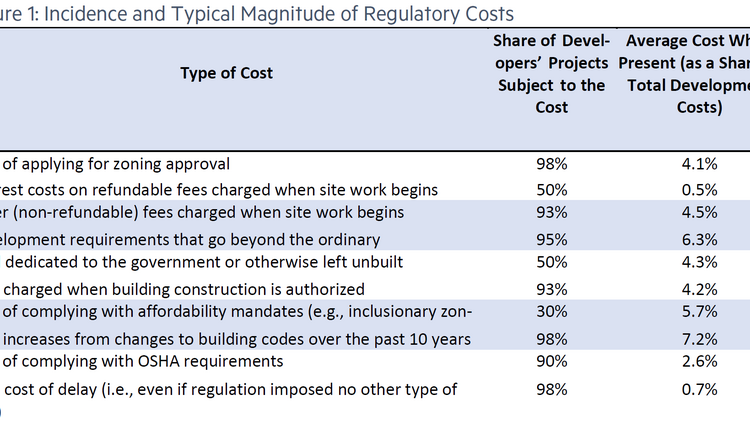 Responses to a survey of regulatory building costs. Separately, as a “cost not captured” by the survey, 85 percent of respondents said they have experienced added costs or delays due to neighborhood opposition. “The current estimate that government regulation accounts for 32.1 percent of total development costs is almost certainly understated to some extent, as it was not possible to account for items like the effects of tariffs on building materials or the extent to which local jurisdictions may empower their citizens to oppose multifamily housing in their communities,” per the report. The NAHB and the Multifamily Council are member organizations who represent the interests of their members — the costs of building being, obviously, a major interest. But the final report argues that regulation is making multifamily less affordable for all.